By Leo Hindery Jr. and Donald W. Riegle Jr.
All we really know about the financial industry bailouts and the economic stimulus plan are their enormous potential costs: at least $2 trillion combined, which is likely to balloon to $3 trillion or even $4 trillion, plus additional trillions of costly credit from the Federal Reserve, with very uncertain payback. However, what is most immediately alarming about the bailouts and the $787 billion stimulus package are the daily indications that they still fall woefully short–in dollars and particularly in focus–of what is needed to confront the emergency economic conditions we face. And emergency conditions they are, with the US economy having contracted at an almost unbelievable annualized rate of 6.3 percent in the last three months of 2008, a terrible quarterly performance rivaled only four times since the Great Depression. The nation is fairly resigned to the costly bailouts, but the stimulus plan is still not close to right: too small by at least half, not nearly timely enough in some of its spend-out rates and too underperforming against the only measure that really counts. The plan’s composition drastically overemphasizes small one-time individual tax cuts ($233 billion) and non-jobs-related spending ($261 billion). But causing most concern is that the 3.6 million jobs the plan is supposed to create or, mostly, just save over the next two years are not nearly as many as they seem to be. This number is less than the 4 million or so additional jobs expected to be lost in the next year (which will only go up if GM and Chrysler are forced into bankruptcy), and it doesn’t even equal the number of jobs America needs to create just to stay even with population growth. The right way to earn our way back to long-term prosperity is through stimulus efforts that will help develop, broadly deploy, fairly compensate and, especially, fully employ our human capital, which will always be our greatest source of national wealth. Only then will we have refired the commercial engines needed to recover from this dismal recession. And only then will we have addressed Americans’ belief that unemployment is by far, with no close second, the most important economic issue facing the country. We need an all-encompassing strategy on the massive scale we used at Normandy to win the war in Europe and that we later had behind the sweeping Marshall Plan to help rebuild Europe’s broken economies. This time, however, our big-thinking strategy must be about creating the 24 million jobs that are missing so that American workers will be nearly fully employed. We cannot accomplish this simply by pouring unlimited borrowed money into our economy on the flawed and unfair premise that it will “trickle down” to where it is needed. This is true whether the money is given to high-income individuals, as Presidents Reagan and George W. Bush did, or distributed in the form of massive bailouts to the big banks and Wall Street firms, as is happening now, with the hope (but not at all the promise) that these bailouts will lead to economy-enriching loans. There are 12.5 million officially unemployed workers, and America’s nominal unemployment rate is 8.1 percent. But these numbers tell less than half of an already dismal story that just keeps getting worse, with record increases in the number of Americans claiming unemployment and the highest number of officially unemployed workers on records dating back to 1967. When we more accurately and honestly include the 10.7 million workers who are underemployed–either part-time of necessity (8.6 million) or otherwise marginally attached (2.1 million)–and the 3.7 million who are in the “labor force reserve” (because they have abandoned their job search), then the unemployment rate rises to a staggering 16.7 percent. In all, there are 26.9 million unemployed Americans, who have little or no financial safety net–and, sadly, there are several million more to come. With only 3 million job openings, mostly at the entry level, we cannot be at all surprised that our food kitchens are serving millions of people, our homeless shelters are filled to capacity and Hooverville-type tent cities are cropping up in every region of the country. Only by finding these millions of missing jobs and realizing their enormous overall “multiplier effects”–every new job indirectly benefits the economy beyond the direct benefits of employment–can we recapture our living standards and continue to project our values and leadership around the world. And only with near-full employment and with a much reinvigorated manufacturing sector can we produce enough wealth to pay off our new debts plus Bush’s massive $11 trillion debt legacy. In his first inaugural address, President Franklin Roosevelt said that the nation’s greatest task was “to put people to work.” This same task falls on the shoulders of President Obama and this Congress. We believe that in the inevitable second round of economic stimulus, Obama and Congress should put nearly 100 percent of the monies toward creating immediately identifiable long-term, high-value, future-oriented jobs. This emphasis should have dominated the just-enacted stimulus plan, but it didn’t, and now even more millions of Americans urgently need jobs with wages and salaries that can support their basic needs and those of their families. History teaches us that no nation can simply borrow its way to sustained prosperity. Nor does long-term prosperity ever come from disconnecting workers’ wages from their productivity, or from a government’s refusal to protect the right of workers to organize, to achieve decent working conditions and to receive a fair share of their productivity gains. Yet this is exactly what has happened on and off for the past twenty-five years, as successive administrations gutted the progressive individual income tax in order to benefit high-income Americans; let most productivity gains go to those at the highest income levels, again through preferential tax policies; and ceased in any meaningful way to protect workers’ rights. As a result, our nation is saddled with an economy that for several decades has bounced from one credit-induced bubble to another. Income inequality is at its highest level since 1928; median wages have stagnated for more than a decade; and, significantly, our once vital manufacturing sector is swamped by our largely service-based economy, which moves incomes around the country but does little to improve our balance of trade. Trade unions, which fostered and heavily sustained both the middle class and the balanced capitalist system in the United States, now represent only 7.6 percent of private-sector employees, down from more than 20 percent as recently as the early ’80s. And instead of seeing gains in real wages earned through higher worker productivity, living standards for all but the wealthiest Americans have been artificially sustained for years by outsize mortgages, home equity loans and credit card debt, and by the growth in two-worker family incomes. This long history of decoupling wages from productivity has also reduced individual savings rates and the aggregate savings needed for capital investment. Many employers have shrunk real wages and benefits while substantially dismantling the employer-based pension system. And in the public sector, excessive tax cuts for the wealthy have left our federal and state governments without the revenues needed to properly fund public education, healthcare and vital infrastructure investments. We also need to address immediately the decades of misguided trade policies that led to the transfer of millions of US workers from export industries into less productive and often lower-paying service jobs. In the 1980s, US-based global corporations, with the complicity of the executive and legislative branches, began to see their overseas operations not just as sources of raw materials but also as cheap production sites, invariably with much weaker environmental standards and fewer rights and protections for workers. In January 1994 the North American Free Trade Agreement became the first legal embodiment of this major shift, followed a year later by the development of the World Trade Organization and then by the United States granting most-favored-nation status to China in 2000–in each case without securing nearly enough reciprocity and enforcement rights. These misguided trade policies, combined with other countries’ much less expansionary macroeconomic policies, triggered the most massive change in trade numbers in the history of any nation. America’s willingness to pursue very expansionary monetary and fiscal policies, by contrast, has allowed many of these countries a “free ride” on our strong consumer demand. The massive $4.7 trillion goods-and-services trade deficit accumulated over just the eight years of the Bush administration–including a $3.6 trillion deficit in the extremely important manufactured goods category–made the US economy about $1.5 trillion smaller than it otherwise would have been. And without any meaningful reciprocal jobs creation here, we lost 4.5 million manufacturing and more than 2 million service jobs, most of them unfairly. America’s cumulative trade deficit since 1980 is an almost unbelievable $7.2 trillion. Those who scoff at the urgent nature of this problem have no real answers when asked how and when America will ever be able to pay off this obligation. And make no mistake, pay it off we must, just as we have to pay off this nearly $13 trillion that is soon to be the aggregate federal debt. Working with those who understand the urgency of creating millions of high-value-added jobs–and the higher family incomes and tax revenues that will follow–the Obama administration and Congress need to “slipstream” behind the bailouts and develop long-term plans to support the renewal of manufacturing. These plans must be designed to stimulate business invention and innovation, and to spur productivity growth across the nation. The objective must be to find those 24 million missing jobs, and their centerpiece must be a much stronger nationwide commitment to healthy, well-educated and well-trained workers, especially in the manufacturing sector. § Immediate passage of the Employee Free Choice Act, which will allow workers to join unions without obstacles. § A national pension policy to restore adequate retirement savings. § Concrete efforts to restore the essential tax-policy link between productivity growth and wage gains, which will almost surely mean adopting a value-added tax of the sort nearly every other developed country already has. § A ten-year program of significant additional public investment to upgrade and rebuild our nation’s infrastructure for the twenty-first century, which would create millions of jobs and make it easier for American-based companies to succeed in the global marketplace. § Major new tax incentives for businesses of all sizes to invest in state-of-the-art laboratories, domestic jobs-focused R&D, innovative products and follow-on manufacturing plants and equipment. § Reauthorize and substantially increase Trade Adjustment Assistance and turn it into a remedial program that is not the displaced workers’ “burial insurance” that it is right now. § Double the $117 billion in aid to state and local governments that was in the first stimulus plan, because every dollar to them represents jobs saved or created. § Authorize and substantially fund programs–like Roosevelt’s Civilian Conservation Corps; later programs like VISTA and CETA; and the Serve America Act, which has already cleared the Senate–that will provide employment opportunities for this year’s 6.4 million high school and college graduates, and for the graduates who follow. § Significantly expand job training for millions of young people to be skilled electricians, advanced welders and computerized machine tool operators, and create millions of complementary apprenticeships in manufacturing and the energy industry. The need for jobs creation is paramount and massive, and the task of meeting this need will be even greater. FDR had to find 13 million jobs during the worst of the Great Depression, and in 2009 we need to find 24 million, albeit in a much larger economy. But still, that’s 24 million jobs! Roosevelt knew that the answer for his administration would not be found only in the private sector, as ideal as that would have been and as much of a believer in capitalism as he was. The answer today won’t be found only there, either. 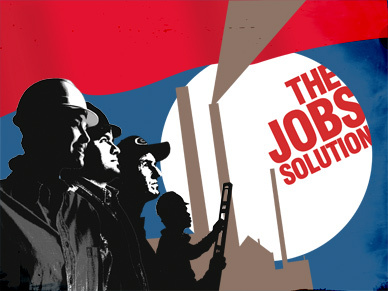 In addition to the public jobs programs for the nation’s youth and the training and apprenticeship programs that we have already called for, the administration and Congress also need to help create millions of jobs for the nation’s adults: those who are young, approaching retirement and who were once retired but now need to go back to work. Specifically, we need a large-scale program to create short- and medium-term jobs that complement those of the companies receiving stimulus-related contracts and subsidies, until these jobs can migrate to the private sector. With thoughtful use of tax policies, we must do everything we can to retain and strengthen the relatively few manufacturing jobs that remain. We need a program that emulates the best of the WPA and the TVA, and then we have to export this program to all fifty states. And we need aggressive public-sector employment initiatives, especially based around infrastructure construction and K-12 education. None of the actions we call for will be easy to accomplish, nor will they come cheap. Yet we need all of them so that American workers can be fully employed in jobs that pay fair wages. We need them to rebuild, and sustain, the great commercial engines that fostered the broad American middle class of the past century and underpinned the global prosperity of the past quarter-century. We need them to bring an end to America’s sorry status as the world’s largest debtor nation. And we need them for our national and economic security. Donald W. Riegle Jr.Former Michigan Senator Donald W. Riegle Jr., a member of the Smart Globalization Initiative and chair of government relations at a global advisory company, was chair of the Senate Banking Committee from 1989 to 1994.